The closest Skydive to Sydney! Tandem Skydiving is the fastest and easiest way to experience the excitement of freefall skydiving, life's ultimate thrill. 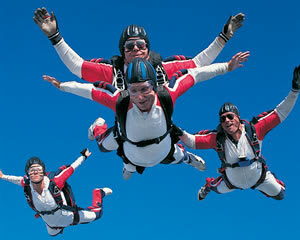 Australia's most popular skydiving venue - over 2 million jumps! As the excitement builds, your expert instructor will prepare you for the countdown and together you will make the ultimate jump from up to 14,000ft! Experience the unparalleled thrill of free-falling for up to 60 seconds at awesome speeds of approximately 200kph. The initial speed and sensation of free-falling make skydiving an adventure that cannot be matched. Once the instructor deploys the parachute, relax in the serenity of a peaceful canopy ride and take in the sensational aerial views. Allow half a day for the whole event. What about spectators? Spectators are more than welcome. It's exciting for them to share the adrenalin rush with you. Why not bring a picnic and spend the afternoon relaxing in the sunshine and watch the colourful parachutes opening across the skies and floating back to earth. Optional free transfers: Complimentary transfers are available from the corner of Wentworth Street and Elizabeth Street, Sydney at 7:00 AM (returning early afternoon, depending on the weather) and 11:00 AM (returning late afternoon). Advanced bookings essential! A big thank you to Lucy from Adrenalin who managed my complicated booking from the start & also the lovely consultant who helped me redeem all of my vouchers (I'm sorry I missed her name) I went with two friends who were going for their first skydive and it was also one of the girls 21st birthday gifts to herself!!!!! They both loved it and I loved my 6th skydive. It was amazing falling through the clouds & getting the adrenalin pumping again! A special thanks to Zac, my instructor on the day! We had an amazing day & will hopefully be back sometime soon to complete our first solo skydive!!!!!! Thank you Adrenalin and Sydney Skydivers! The experience was thoroughly enjoyed and we would definitely do it again - although slightly out of our budget to make it a habit!